Music doesn't sell itself. Writing songs is only half the journey - you need to get them heard. Even great songs need to be found, and it usually takes a lot of work to get them heard over the din of thousands of other acts trying to do the same. People won't know, and they'll never know about your music unless you tell them. Yes, music is art, but it's also a product with consumers. And like any product, it needs to be sold in order to build a fanbase who want to have your music in their lives. That doesn't mean it has to be done in a desperate and crass way. You can promote your music in the best way for you, and get the followers for your music that will impress promoters you approach for gigs. But there are basic principles everyone can follow. It's a big world online, so it's vital you maximise your chances by targeting various channels in the right way. Your identity online as an artist isn't just about one base (eg, a Facebook page or a website), you need to have a presence in as many places as possible to maximise your exposure: Facebook, Twitter, Instagram, YouTube, Soundcloud, Bandcamp, ReverbNation, Spotify... spread your name and tunes far and wide. Potential fans are much more likely to give your music a chance if they have something to look at while they listen. Setting up for rehearsal with a couple of well-placed condenser mics going straight into DAW software on a laptop, plus a friend with a video camera/smartphone is a fairly straightforward way to make a series of 'in session' videos for your songs and promote yourselves as a live band, too. It's a given you'll already have good songs that have been well produced, but these session videos will be something extra to put out online. Try to use a couple of different angles to keep things dynamic. One static camera and a friend moving around getting close-ups is a minimum, and if you can borrow a GoPro to clip on a headstock for some fretboard action - even better! If you're only communicating online when you have a gig or song to plug, your posts are going to be few and far between. Try to keep updating without spamming the same things over and over; people will get tired of that fast. Interesting pics of your gear from band practice, insight into your recording sessions, gigs that you've attended and how they've inspired you, and even sharing music by other local artists, are all ways to reinforce your identity as an artist and stay active in the eyes of your existing and new followers. It will make them more receptive when you have a new song or gig date to share. Your priority if you are a gigging artist is to build a local following first, but it's important not to confuse your own friends with a fanbase. Friends might want to support you by attending your first few gigs but you need to reach out beyond that to people who will listen to your music for reasons beyond a sense of obligation. Though Facebook offers the option for you to 'boost' your posts by paying a fee and becoming a sponsored post on an estimated number of people's news feeds, the cost/result ratio may not be worth it for some. This might be partly because Facebook's algorithm prioritises individual people over businesses and organisations; and that includes bands. Take things back to a grass roots level online - any way you can get your posts shared by individuals is good. Do you friends feature in a video you've made? Tag them, then their friends will see. A Facebook page is easy to build, but don't presume you don't need a website. It adds a professional touch and offers greater control over the way you present your music. Your social media profiles should link to your site and vice versa. Sidestep the algorithms of social media and send out regular updates via a mailing list, too. How do you get email addresses? Offering a free song or EP download in exchange for an address is a good place to start. You'll get more passing trade from searches on YouTube by uploading a cover version. The US band Boyce Avenue launched themselves after having huge success doing this. Choose some popular artists that have fans who you think might be interested in your music. 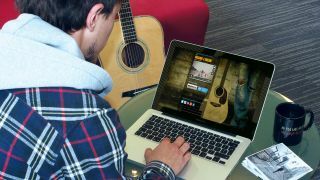 Post friendly introductions to your music on their forums, YouTube videos and profiles with links to find out more. Don't just gig with other bands - promote each other, share fanbases. And don't be shy about tactfully posting a link to your songs on the Facebook pages of venues you're playing because they will rarely do it for you. Separate yourself from the pack and keep people coming back - for example, release a new song free every month until you have an album after a year. Look at other local artists - how well are they doing? How do they present themselves online? If you're an unsigned act, you'll need to sign up with an online distribution service to get your music on services such as iTunes, AmazonMP3, Google Play Music and Spotify. A website builder for musicians; choose from template designs or use their editor. You can integrate a store, too. Get the free trial, then prices start from $9.95 a month. The best service to upload your songs, then embed them on your site and social media. You can gain your own followers through your profile and follow others, too. Ed Sheeran: "If I'm a fan and every month I have got new music to listen to, it doesn't matter whoever it is, I'm going to become more of a fan, just because there's more music to listen to. So if you are a singer/songwriter trying to build up a fanbase, the best thing to do is just to release as much as possible." Ron Pope: "Wherever people live, that's where you have to go with your music. There's no such thing as mystique now. You've got to live where the people live; if people are on Twitter, you have to be on Twitter." Gabrielle Aplin: "It's just using all of those resources to your best advantage - Facebook, Twitter, all that. Putting your music online is really important, too, for free! I don't think you should sell your first EP for £5, or whatever. You shouldn't even care about money - just about getting it out there and making the most of all your opportunities."